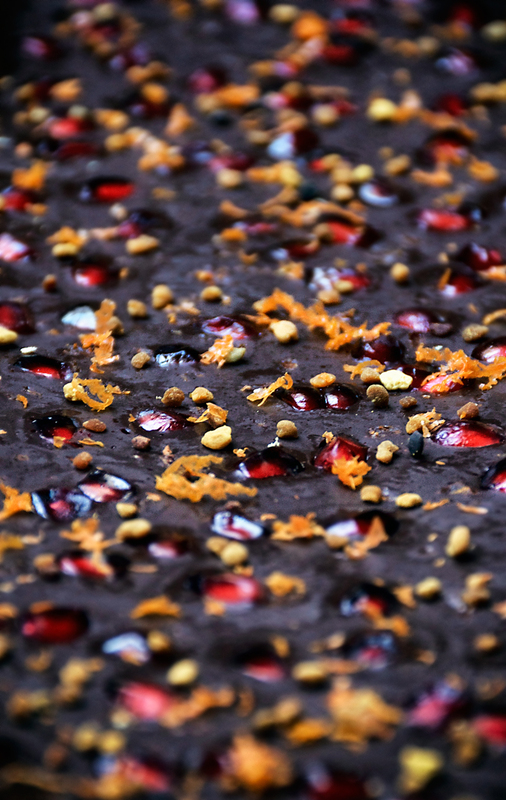 Homemade raw chocolate made with honey, pomegranate, and orange for a juicy, fruity chocolate bar. 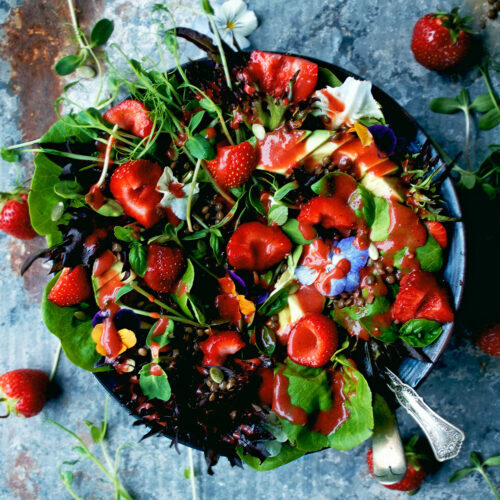 Raw chocolate has piles of health benefits and only takes a few minutes to make – this version is holiday inspired and mades a pretty food gift. Raw chocolate is a wonderful natural superfood and really very easy to make – you can create your own custom chocolate bar in a few minutes, using whatever suits you. 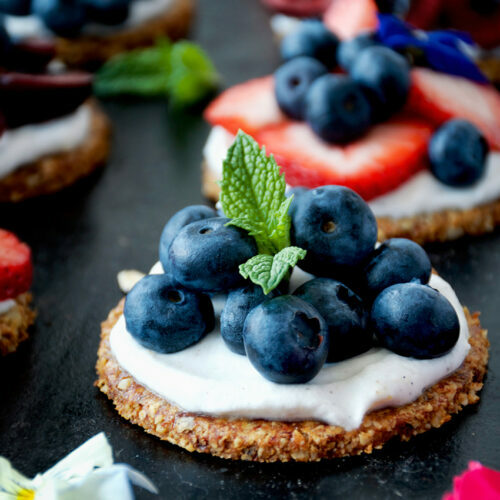 With just five ingredients, plus whatever you decide to add as topping – this time I chose my favourite seasonal fruits for the holiday period but at other times of year I’ll leave it plain, or add berries, or different spices. It’s a simple way to get a healthy chocolate fix without the sticker shock. Is anyone else appalled by the price of raw chocolate? Every time I see any ‘healthier’ sweets in the store I get sticker shock, especially with easy treats like this. Raw chocolate couldn’t be easier to make and the ingredients are so easy to come by these days, especially if you choose coconut oil instead of cacao butter – more on that later. 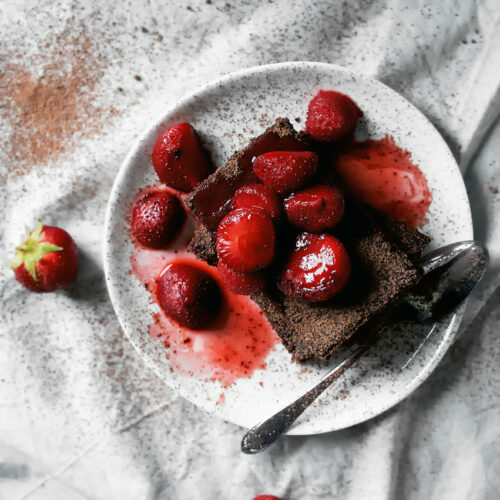 I’ve written about raw chocolate a few times (here’s a recent example) but it’s a staple for us, especially when I’m hormonally raging and need chocolate to get through those few days of the month when everything seems to shut down. All the raw chocolate recipes I’ve posted here in the past have been as part of another treat, to coat whatever goody is hiding inside. This is more of an I need chocolate right now kind of recipe, instead of as part of a larger, more time consuming project. Take a couple minutes, make chocolate, and feel better. 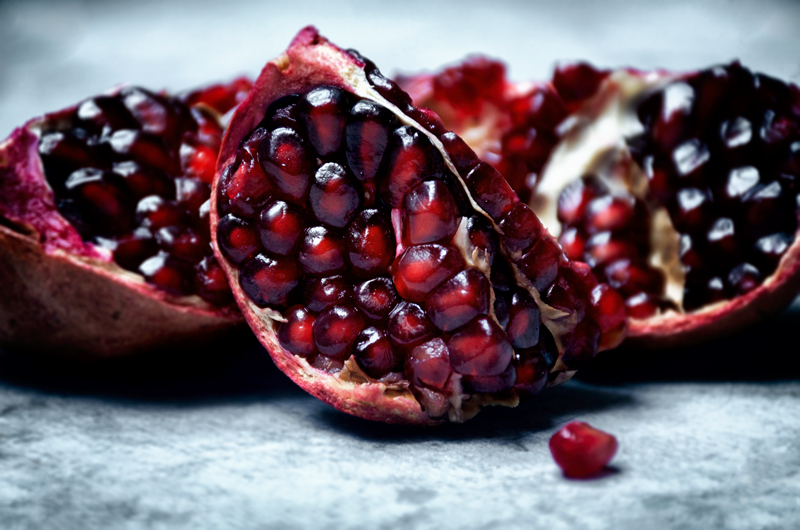 This recipe uses pomegranate arils, fresh ginger, orange zest, and bee pollen. The resulting bar is extraordinarily fruity, almost juicy. It’s a bit of a shock that chocolate can taste like this. I prefer to keep this particular bar in the fridge instead of the freezer so it stays a little bit softer, almost like a truffle, instead of snappy crisp chocolate straight out of the freezer. It has to be eaten within a couple of days so the pomegranate doesn’t get soggy, but I’m sure you won’t have a problem with that. I kept opening the fridge and sneaking little pieces when I made it and it was gone within the day. An extra bonus with this chocolate is just how pretty it is, which makes it a perfect gift, even if it’s a gift to yourself! 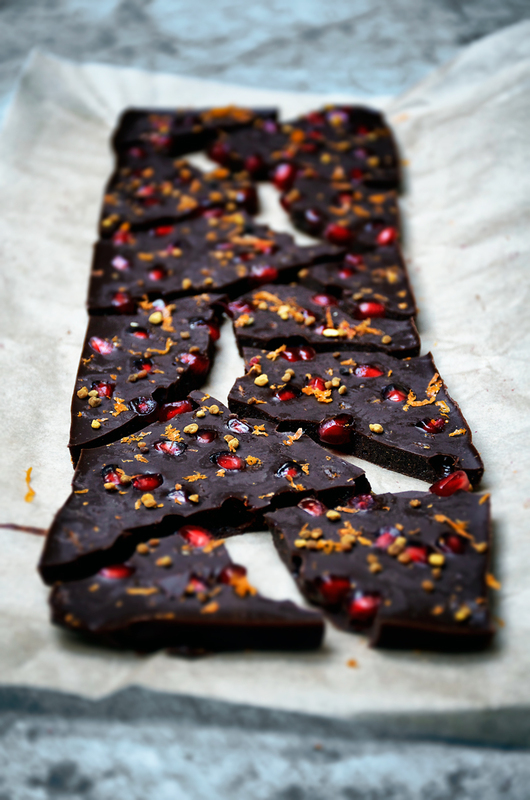 Homemade raw chocolate made with honey, pomegranate, and orange for a juicy, fruity chocolate bar. Raw chocolate has piles of health benefits and only takes a few minutes to make - this version is holiday inspired and mades a pretty food gift. 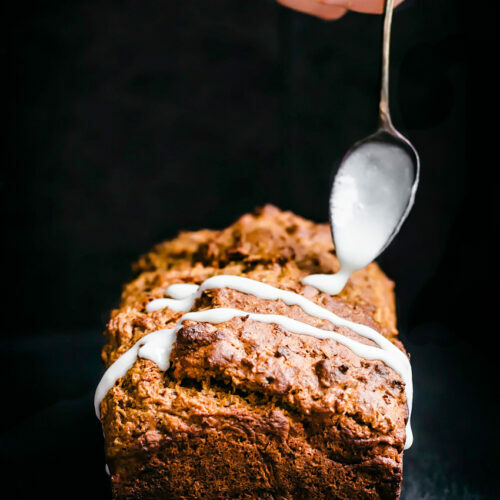 Prepare a container or loaf pan by lining it with parchment paper. In a glass bowl set over a saucepan of simmering water (don't let it touch the water), gently melt the cacao butter. Remove from the heat as soon as it's melted and whisk in the honey, mixing until it's fully incorporated (see tips). Whisk in the cacao powder, ginger, vanilla, and salt until combined and glossy looking. Pour the chocolate into the prepared container and top with the pomegranate, bee pollen, and orange zest. 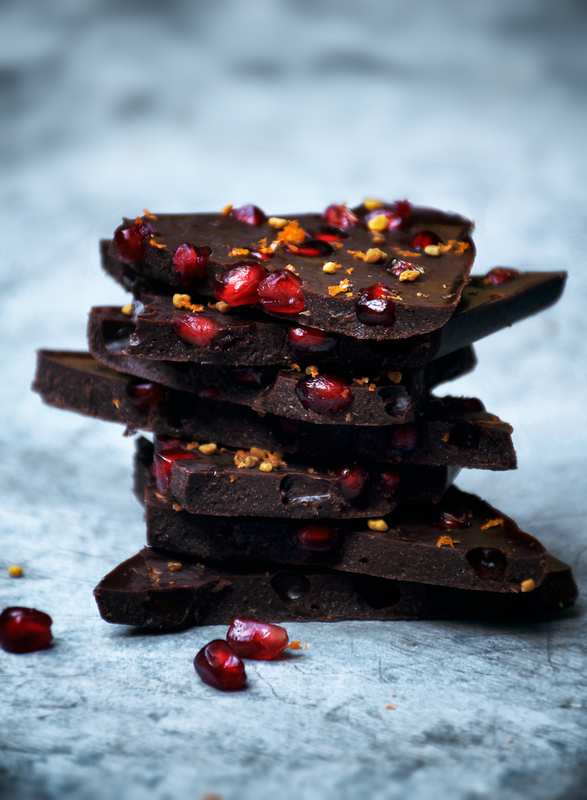 The pomegranate seeds will sink slightly into the chocolate. Place the chocolate into the fridge to solidify for at least two hours, then break into pieces and serve. Keep it in the fridge in a sealed container for up to three days. • Whisk the honey into the cacao butter for a little extra time than you think you need to. If you don't mix them together fully, they don't emulsify, and your chocolate runs the risk of separation. See this post for a photo and extra guidelines if you're not sure what to look for. Your honey/cacao mixture should look like soft butter before you add the cacao powder. • Different types of honey will result in different flavours of chocolate - for an especially fruity taste, try wildflower honey if you have it. * Coconut oil can be substituted for all or some of the cacao butter, but the texture and flavour isn't nearly as good. Spring for cacao butter if you can, it lasts a long time, and is cheaper to buy online than in the grocery store. ** For a vegan option, use maple syrup in place of the honey. The chocolate will be a little less soft than it is made with honey, and will no longer be raw. *** Only zest the orange part of the fruit, not the white pith underneath. The pith is very bitter. Use a microplane if you have one. Bee pollen!!! First time I see that! Interesting! nothing like a good dark chocolate made with smooth cacao butter! Yum! I've never made my own chocolate. The flavour combination of pomegranate and orange sounds delicious though and bee pollen is an interesting addition. I usually take bee pollen (propolis) when I have sore throat. Oh, and the photos! They are absolutely stunning! Yum! I will definitely be giving this one a go! I love my raw dark chocolate and often make my own sauces at home but haven't found a homemade chocolate that I love — I have a feeling this will be it! My favourite store bought, raw dark chocolate has freeze dried pomegranates in it (it's my all time favourite chocolate combo) and you're right, the price is astronomical! I've also been meaning to try bee pollen. Can't wait! Hope you had a lovely weekend, Alexandra. You should try it, Julia! It's so quick and the results are incredible. Bee pollen is wonderful for helping to prevent things like sore throats 🙂 thank you! Hooray, glad to hear it Justine! I had to mess around with measurements for a while before I started making raw chocolate that I really loved too. I used to always make peppermint raw chocolate but haven't since we moved, and now pomegranate is my favourite! I swear, they're making like 9000% profits or something.